Several reviewers have noted that these Bissell steamers make light work of removing both set-in and fresh stains alike. Many reviewers also noted their effectiveness at removing pet stains from even the most delicate carpeting. Based on these reviews, we've gathered that Bissell's carpet cleaning machines are among the most effective ones around. Below are lists of all the portable/handheld and full-sized carpet cleaners that we carry. For more information about any of these products, please see their respective product pages or feel free to call us at 1-866-972-8227. 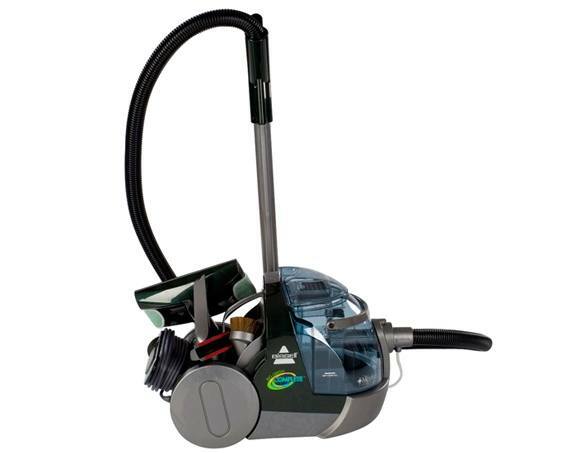 This portable Bissell Little Green Steam Cleaner weighs in at 12 pounds and features a 48 ounce tank capacity. Its included Tough Stain tool removes stains to leave your carpeting looking like new. It also includes 2X Spot and Stain Formula to remove stains from even high-pile carpeting. 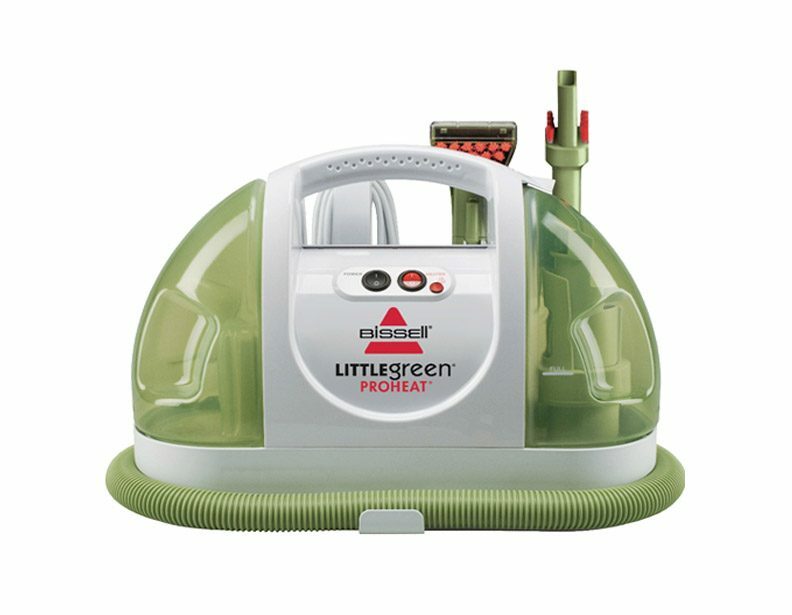 The Little Green Steam Cleaner is made with the environment in mind: it is constructed from 50% recycled plastic, has PVC-free parts, and its packaging is made of at least 50% recycled content. 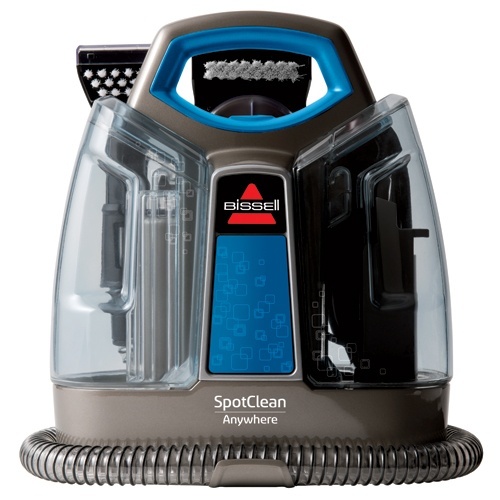 This Bissell SpotClean Anywhere portable steam cleaner weighs only 9.2 pounds. It uses Bissell's Heatwave Technology, which keeps its tap water hot using heat emitted by its vacuum motor. To ensure powerful, steady steam with each use, this feature turns on or off with the machine. 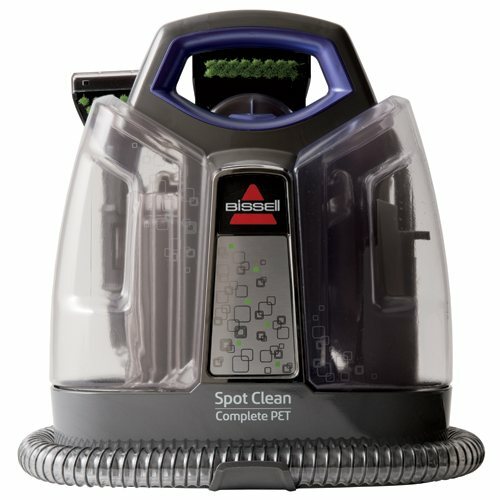 The Heatwave Technology on this Bissell SpotClean Complete Pet portable steam cleaner keeps its water hot via heat emitted by its vacuum motor. A 3" Tough Stain tool makes easy work of removing pet stains from even high-pile carpeting. It weighs in at 9.2 pounds and has a 37 ounce tank capacity. 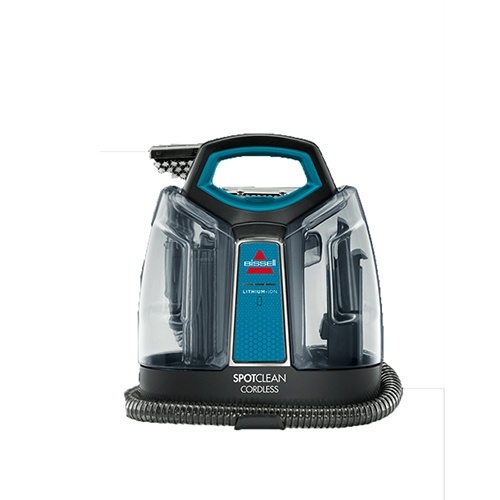 This Bissell SpotClean Cordless steam cleaner is easy to transport and use wherever messes appear. For added ease, it weighs only 8.1 pounds and features a convenient carry handle. Its battery status indicator functions similarly to a stop light, flashing green when it is ready to go and red when it is time to stop for a charge. 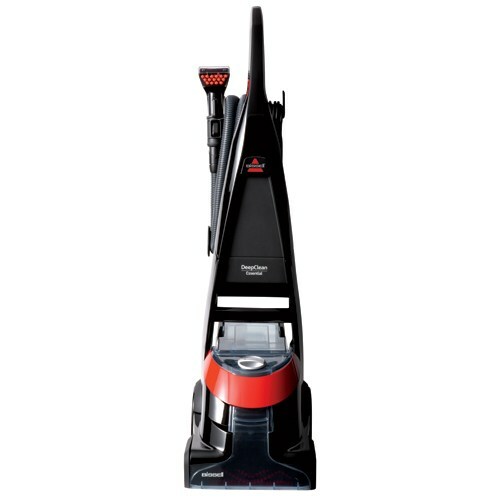 A single charge will grant you up to 20 minutes of continuous spot cleaning power. 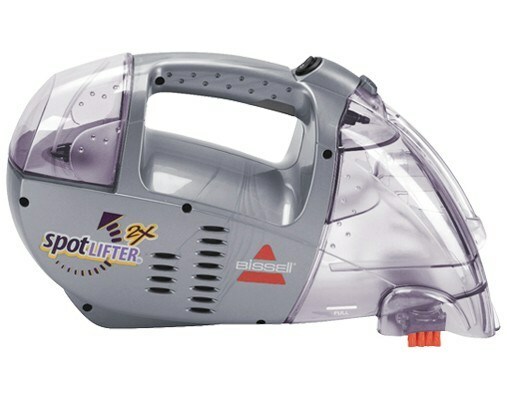 This cordless Bissell Spotlifter 2X steamer grants you up to 15 minutes of continuous run time on a single charge. It quickly sprays, suction cleans, and dries messes to leave your carpets looking like new faster. It weighs only 6.25 pounds and offers a 12 ounce dirty water tank capacity. 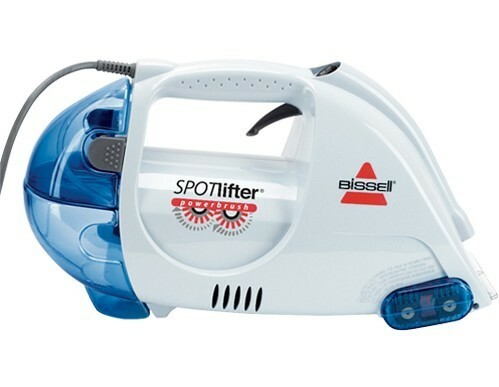 The Bissell Spotlifter Power Brush steamer uses a powerbrush to loosen dirt, debris, and stains before spraying its cleaning solution. After loosening, the Spotlifter suctions debris and dries the surface of your carpet. An 18 foot power cord grants you a generous cleaning radius, so you can take this little steamer wherever stains appear. "This little machine is a life saver, I have dogs and cats, dogs coming in with dirty feet, cats throwing up hairballs. 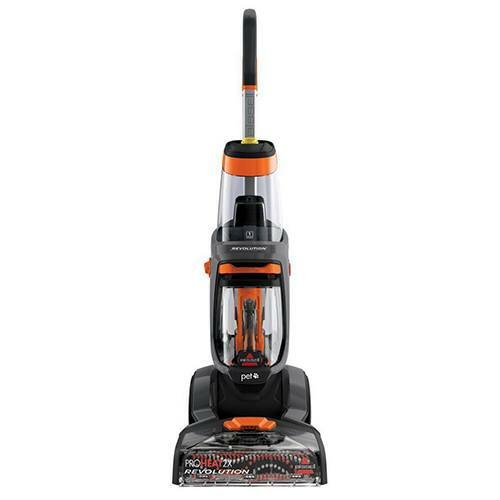 I do also own a Bissell pro heat complete pet 2x, witch I also love but for little clean ups, this is a life saver and the machine is so easy to use. I do recommend this spot lifter power brush." -Marianne D.
This Bissell Little Green Proheat steamer offers a generous 48 ounce tank capacity and built-in water heater. It is recommended for use on carpets, upholstery, car interiors, and stairs, and includes a crevice tool for added versatility. For stain removal, the Little Green Proheat includes a 3" stain tool. This eco-friendly portable steamer is designed using 50% recycled plastic. 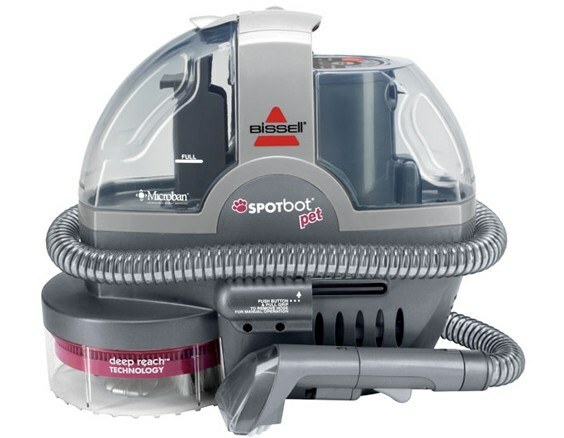 This Bissell Spotbot Pet portable steam cleaner offers convenient hands-free operation. Simply plug the unit in, set it down where you would like it to clean, and let it get to work. It utilizes Deep Reach and Spiral Brush technologies to lift stains from upholstery, automobile interiors, stairs, and low-pile carpeting. Among its other notable features are a 16' power cord and an included 3" stain tool. 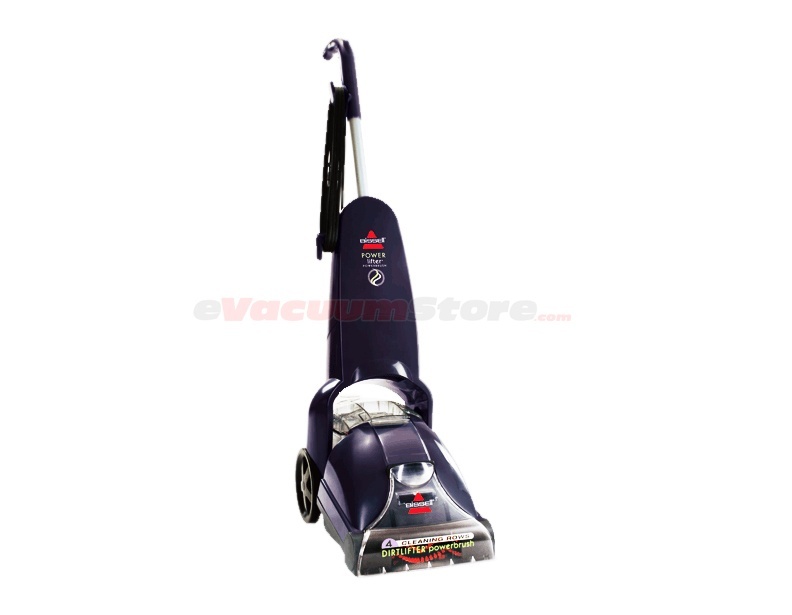 This Bissell SpotClean Pro Steamer features a generous 3/4 gallon tank and 22' power cord. For ease of transport between rooms, it also has a carry handle. Attachments include a 3" stain tool and 6" stair tool, which makes easy work of cleaning on stairs. This cleaner is recommended for use on carpets, upholstery, stairs, and auto interiors. 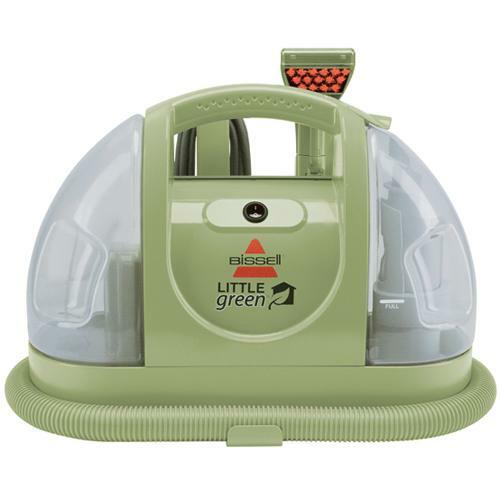 This Bissell Big Green Complete Deep Cleaner canister vacuum features three-stage filtration technology. Its third stage, a high-efficiency HEPA filter, removes 99.97% of particles down to 0.3 microns in size from exhausted air. Its built-in heater loosens and lifts even the most stubborn dirt from carpeting. This cleaner is recommended for use on surfaces from bare floors to deep-pile carpeting. This Bissell DeepClean Deluxe Pet carpet cleaner features EdgeSweep technology to make easy work of cleaning around baseboards and walls. Its Surround Suction allows for quick surface drying, and its included 2X Pet Stain and Odor cleaning formula discourages pets from messing in the same spots over again. For ease of transport between rooms, this 24.8 pound cleaner has a carry handle. The Bissell DeepClean Essential carpet cleaner uses Heatwave Technology to keep its tap water hot as it cleans. Its Edgesweep technology allows for easy cleaning around baseboards and along walls. For added cleaning range, the DeepClean Essential includes a deep reach tool, pet stain tool, stain trapper tool, spraying crevice tool, 2-in-1 crevice tool, TurboBrush tool, stair tool, and a hard floor attachment. Twelve rows of dual-rotating powerbrushes lift dirt, debris, and grime out of even high-pile carpeting. As its name implies, this Bissell DeepClean Lift-Off Pet carpet cleaner is ideal choice for pet owners. 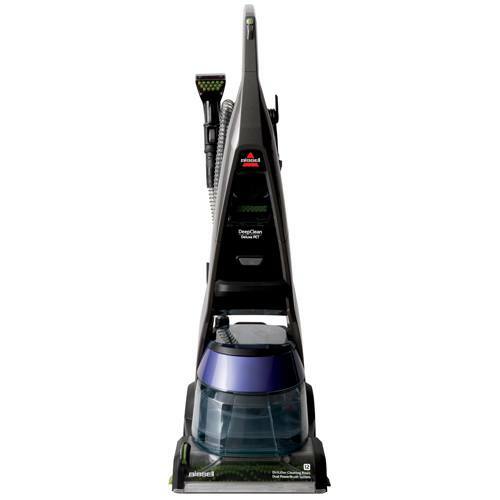 It features 12 rows of dual rotating power brushes to lift and remove stains from carpeting, and uses Surround Suction technology to quickly dry the cleaned area. What's more, this carpet cleaner features a handy 2-in-1 configuration. Simply detach its steam unit from its frame to use it as a portable steam cleaner. 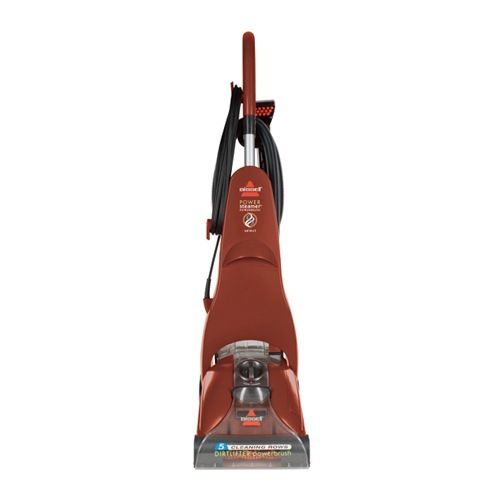 The Bissell PowerSteamer PowerBrush Select Deep Cleaning System features five rows of fluctuating cleaning bristles to agitate and lift even deep or set-in stains and debris. For cleaning in hard-to-reach places, this cleaner includes such attachments as the stain tool, which provides concentrated cleaning power to above-the-floor surfaces. 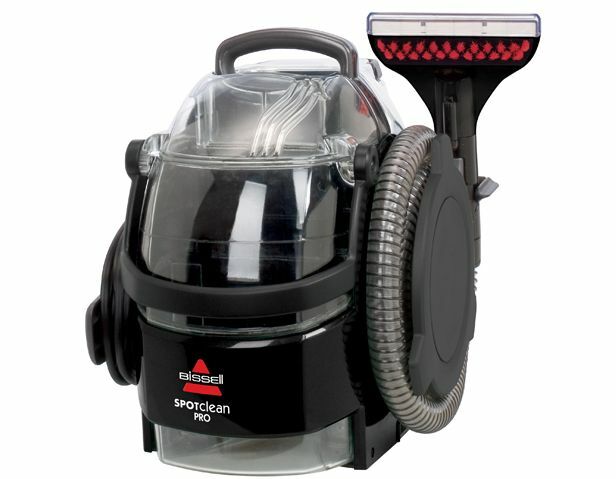 A 25 foot power cord and 10.5" cleaning path means that there's no surface out of range for this Bissell steam cleaner. This Bissell ProHeat 2X Premier carpet cleaner uses Heatwave technology, which utilizes the motor's heat to keep its water warm. Adjustable cleaning modes and EdgeSweep technology ensure that there is no stain this ProHeat cleaner can't clean. Attachments include a crevice tool, a dusting brush, an upholstery tool, and a pet stain tool. A generous 1 gallon tank capacity and 22 foot power cord ensure that you'll be able to clean a wider range without frequently needing to refill or change power outlets. This Bissell ProHeat 2X Revolution PET steam cleaner features two different cleaning modes. Deep Clean mode provides a more powerful clean for tough stains. Express Clean Mode is for quick clean-ups. Its included attachments (a crevice tool, a dusting brush, a crevice tool, and a Pet Stain tool) all attach to its slinky hose for added range and versatility. 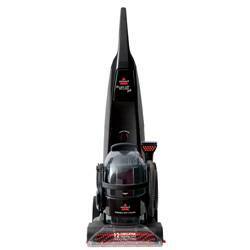 What's more, the low-profile cleaning head makes easy work of cleaning under beds, tables, and other low furnishings. This Bissell Big Green Dee Cleaning Machine stands in good company with Bissell's commercial cleaning appliances. Its enormous 1.75 gallon tank requires far fewer refills than smaller tanks. 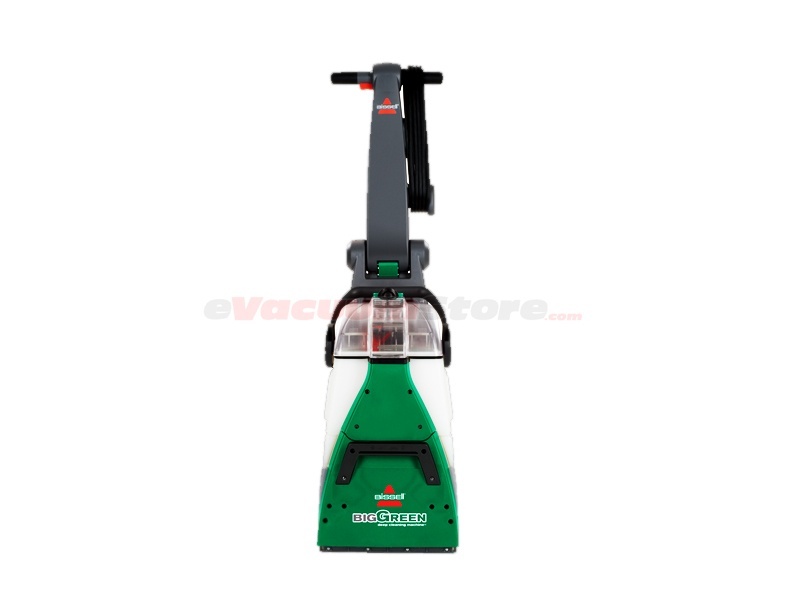 This Deep Cleaning Machine also uses revoultionary fast-drying technology, and cleans in both forward and backward passes to reduce cleaning time. Among its other notable features are an included stain tool and 9 foot upholstery hose for added cleaning range. *Customer reviews taken from their respective product pages at Bissell.com.